Barry Newman is a cop-killing fugitive who gets involved in a shady deep-sea salvage deal. 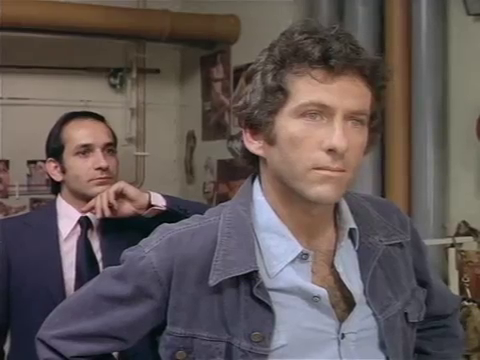 It’s also got Ben Kingsley – with hair! “Fear is the Key” has a lot going for it – a cracking Roy Budd soundtrack, some staple 1970s action visuals (hub caps pinging off cars in a chase, helicopters with inflatable skis), very bad clothes, and a just post-“Vanishing Point” Barry Newman behind the wheel of both a red Ford Gran Torino and, bizarrely, a bathysphere. Yes, you read that right. On the downside, the pacing of the film is off. A twelve-minute plus car chase is like a precursor to “Smokey and the Bandit” and suffers from terrible continuity (check out the right front wing of the car), not to mention the endless drone of police sirens, and elsewhere director Michael Tuchner submits us to such thrilling spectacles as people taking sowesters off. Newman plays on-the-lam John Talbot, who escapes a small town Louisiana court house by shooting a policeman and grabbing rich heiress Suzy Kendall as a hostage. Evading the law, he’s eventually snared by ex-cop Jablonsky who, rather than turn him in, brings him to Kendall’s daddy to collect a $$$ thank-you for returning her. And from there, it all gets a little unlikely, as you might expect from a plot based on an Alastair MacLean novel, when heavyweight John Vernon as a dodgy businessman and a crazy-eyed Ben (“That’s Sir Ben to you!”) Kingsley as his henchman force Talbot into piloting a bathysphere into the depths. Was there really no one else they could get? No, let’s take the dodgy, unreliable fugitive. Nothing can go wrong with that. Curious casting gives “Fear is the Key” something a little different – quite how Brit-film and TV stalwarts Ben Kingsley, Ray McAnally and Tony Anholt ended up in this is a mystery. Newman is good enough, while John Vernon is, as usual, sleeping through the criminal half of his range (the other half usually seeing him as the Mayor or college Dean). Note: drawing does not resemble Oliver Reed. “Sitting Target” sees Oliver Reed and Ian McShane get nasty in an early 70s Brit crime flick that comfortably overcomes a few glaring holes to deliver a swift thriller and an unexpected twist. A year after playing brassy diamond smuggler Tiffany Case in 007 adventure “Diamonds Are Forever“, Jill St. John visited the grim tower blocks of south London to play the wife of Oliver Reed’s brutal Harry Lomart, and play her rather well. It’s the first of several oddities in this enjoyable Douglas Hickox-directed villain flick, that includes Dot Cotton aka June Brown in a blink-and-you-miss-her role, Edward Woodward at the height of his Callan fame, and Frank Finlay appearing in a second Too Late review after his turn in the previous post “Lifeforce“. Reed’s Lomart is banged up at the time he gets the rotten news his wife is knocked up. 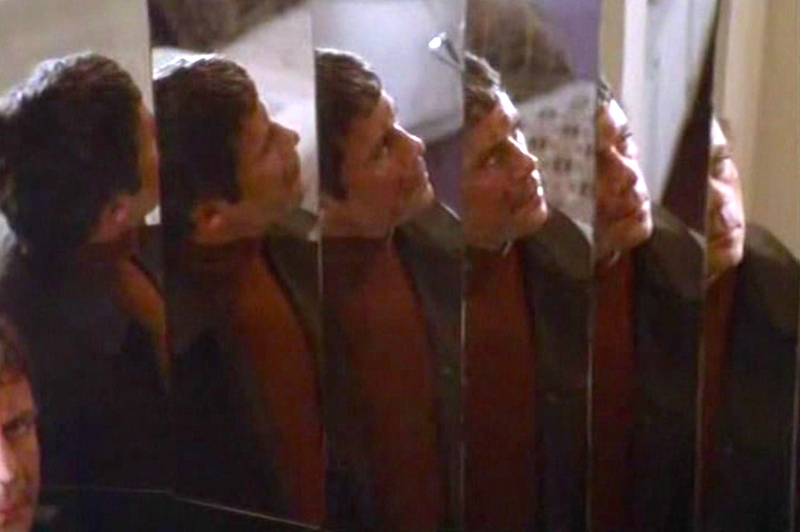 He greets this by punching through the glass divide that separates prisoner from visitor and trying to strange the Mrs.
A stint in solitary later, Lomart and his hoppo Birdy (Ian McShane) break out of prison and hunt down the errant Mrs Lomart with only her murder in mind. In case you were unsure just how dodgy Reed and McShane are, they brick a dog to death while escaping. Nasty. 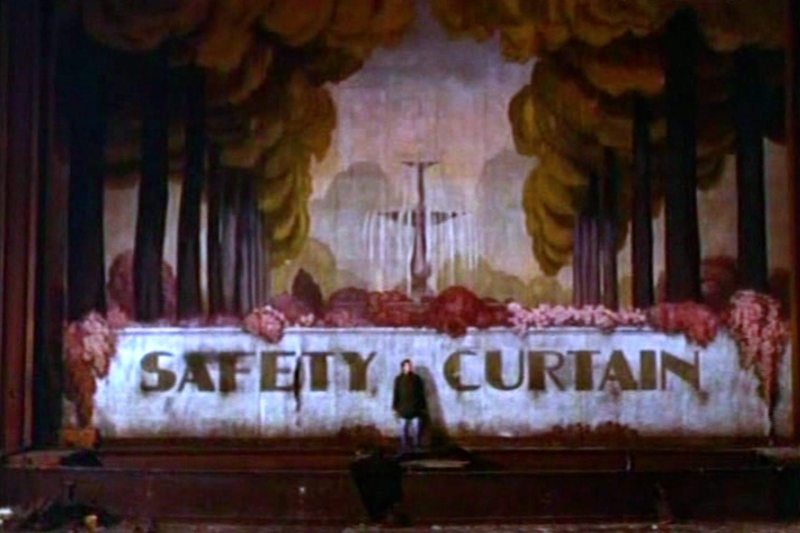 Edward Woodward is the cop out to stop them and protect St. John. Finlay is their old accomplice who now wants nothing to do with them. Clapham seems to be the location for most of the action. Thesis alert! Film plays with multiple images repeatedly, film scholars. It rattles along at a fair old pace, helped by future Bond director John Glen editing sharply, while Stanley “The Comeback” Myers‘s score fits the time and action perfectly. Reed is the star, commanding the screen in the way few British actors have done since, and it really is hard to think of someone who has the menace he had – think Bill Sykes in “Oliver!” x 10. McShane keeps chirpy company, while both carry on the criminal business with an inevitability of their fates. They’re murderous crooks, see, and they know it only too well, even if normally shooters ain’t their way. On the downside is a questionable lack of initiative by some characters when opportunity presents itself, some iffy dialogue, a man-motorcyle chase in and out of hanging laundry (not kidding) and a ludicrous Mauser pistol + stock and sight that seems to have the range and accuracy of a sniper’s rife and the delivery of a sub-machine gun that would make Rambo proud – all from a nine-round magazine. But the film carries it off. London, especially, is shot like a historical record, and at an interesting time when its south-of-the-river tower block estates were pre-ghetto or demolition. Car chases take place through any number of curious archways and tunnels, and the rundown Putney Hippodrome exterior (interior was apparently not Putney but you can see it inside and out a year later in the same director’s splendid “Theatre of Blood” with Vincent Price) provides the perfect place to stash cash. 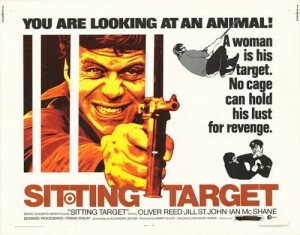 The late 60s/early 70s provides a handful of revenge classics, “Point Blank” and “Get Carter” being the obvious names, but “Sitting Target” is worth keeping in your sights too.